Dottore Gianni was treated to a great day trip earlier this week by his brother Phil (the good doctor is the oldest of five siblings, a sister and three brothers. Phil is the second youngest in the family, twelve years younger than il vecchio dottore. Interestingly, none of his siblings has an Italian name, one of the main things that distinguishes Dottore Gianni, makes him unique, makes him, some might say, a bit weird!). 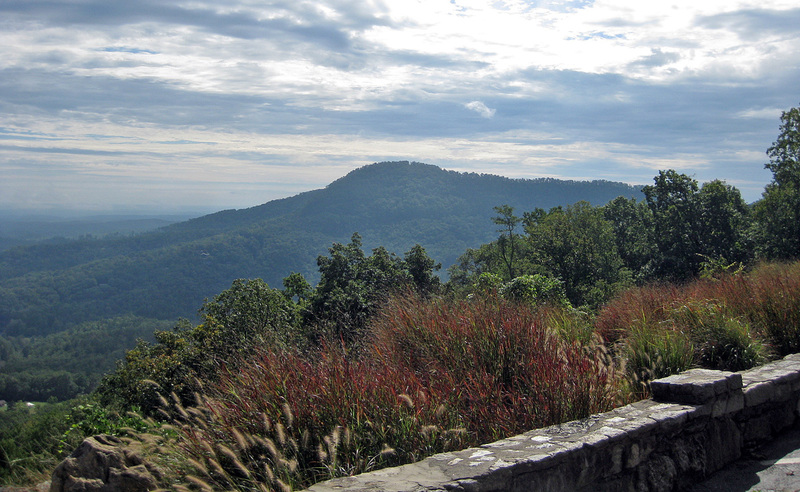 Once again the destination was just across the border in North Carolina, once again we headed into the mountains. The specific spot? 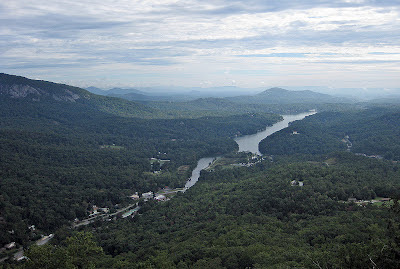 A beautiful place called Hickory Nut Gorge. As almost always in Dottore Gianni's blogs a bit of history is in order. The land we visited was in the past Cherokee country, and almost certainly the first human that saw the gorge was a Native American. Wonder what s/he thought? 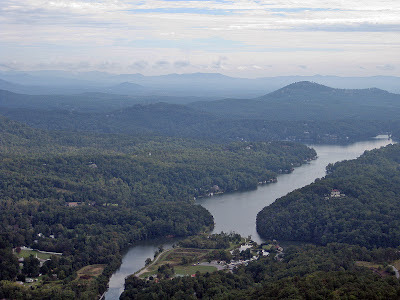 I found it breathtaking, but of course the Appalachians are a breathtaking part of the world -- was this particular gorge just another old gorge for the Cherokee? Or something special? 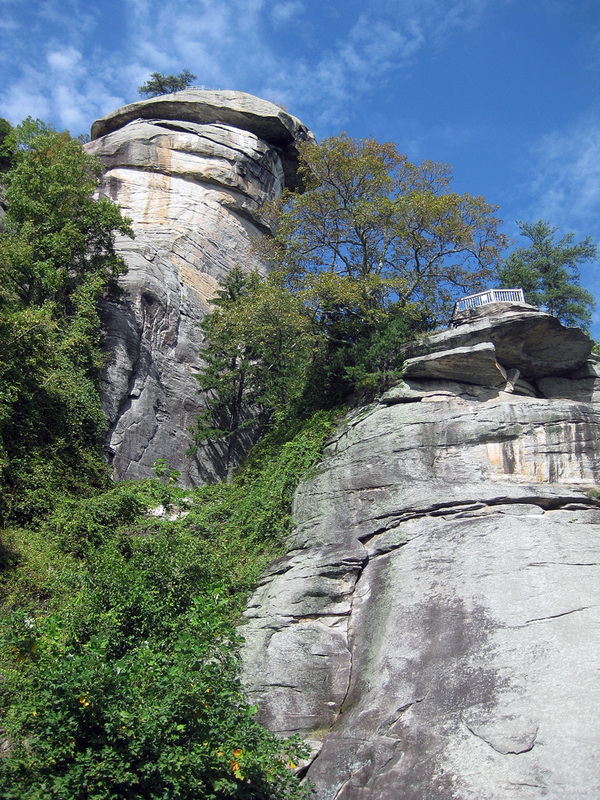 The most obviously special and still central attraction of the Gorge is a unique outcropping of rock at close to 3,000 feet altitude that someone somewhere back in time astutely observed resembles a chimney; thus its name, Chimney Rock. More of that anon. 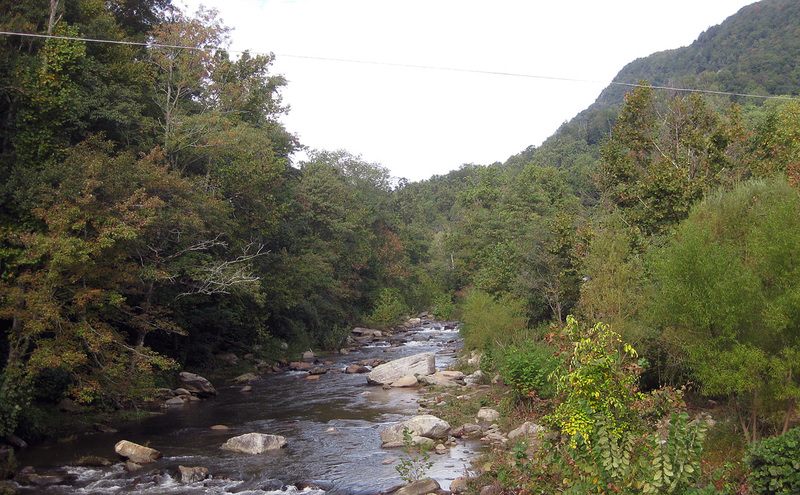 The Rocky Broad River runs through the gorge, which is one of the few natural westward passages through the mountains. By 1830 stagecoaches were using the lowland near the river as a route from the east to Asheville and beyond. The road created for the stagecoaches also attracted settlers, and the area became more and more populous. Later a railroad was built through the area for more rapid and efficient transportation. Population grew further and the area became popular with visitors, two of whom included Franklin Roosevelt and F. Scott Fitzgerald. The area owes another natural (well...not quite natural as we'll see) element of the area, Lake Lure, to a doctor, Lucius B. North, who was himself diagnosed with tuberculosis and advised to seek a healthy climate. He moved to the area from Missouri (who wouldn’t want to leave Missoure, given the chance?) and immediately fell in love with it. 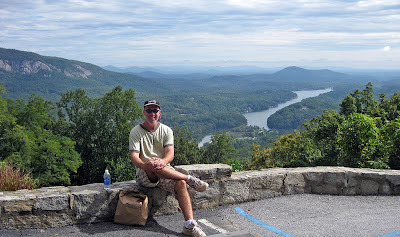 One day he hired a man to take him up Chimney Rock and from that vista the good doctor (the OTHER good doctor, notes Dottore Gianni) envisioned a resort that would include the Rock and the great valley below. In his vision Morse saw a lake as well, but alas, there was no lake in Hickory Nut Gorge. But where there is a will (and enough money) there is a way, so Morse and his brothers pooled their resources and bought 8,000 acres encompassing the mountain, the gorge and the valley. 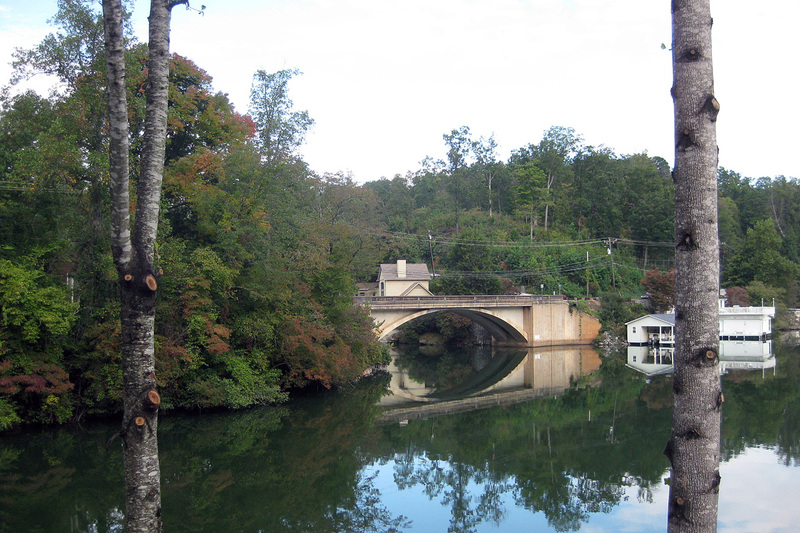 In 1925 a dam was begun, in part to harness power, in part to create Lake Lure, and it was completed in 1927. That same year a town of the same name was incorporated, and an inn, which still stands today, was built (more of that inn soon). It’s said that the Lake was named by Dr. Morse’s wife, because she found its nearly natural beauty…alluring. I was actually quite surprised at this, as when we first came in view of the lake I was reminded somewhat of the Finger Lakes of New York State, from whence I ventured south into the Carolinas. I thought it might have been created in a manner to those Finger Lakes, via the advancement and later recession of ancient glaciers. But no! 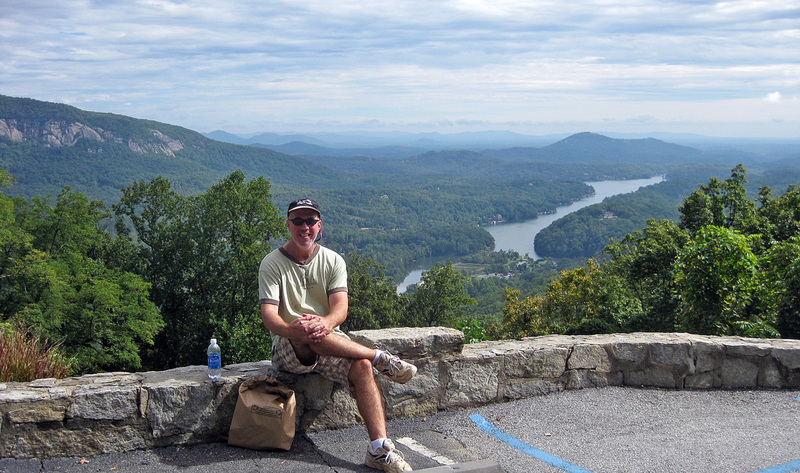 The alluring Lake Lure is a man-made lake, and it is quite lovely. Back now, and about damned time some of you are thinking, to the adventures of Jack and Phil! My younger brother knows this area well, as he has lived here for seventeen years, and was married to his lovely wife Kara outdoors on a mountainside in not too far away from here. He drove and our first stop was the bank of the lake. I was very impressed with the view, and almost immediately decided that even though it is very close to where I live, I might well spend a night or two in a B&B along its banks. After a brief photo stop there, we drove to the other end of the lake, at which is placed an inn, which is called The 1927 Lake Lure Inn and Spa. Hmmm…I think they might be trying to shove a bit too much into that title, as I’m fairly certain there wasn’t a spa there in 1927, in fact brother Phil assures me that when he and his wife spent a night there about twelve years ago there was no spa. 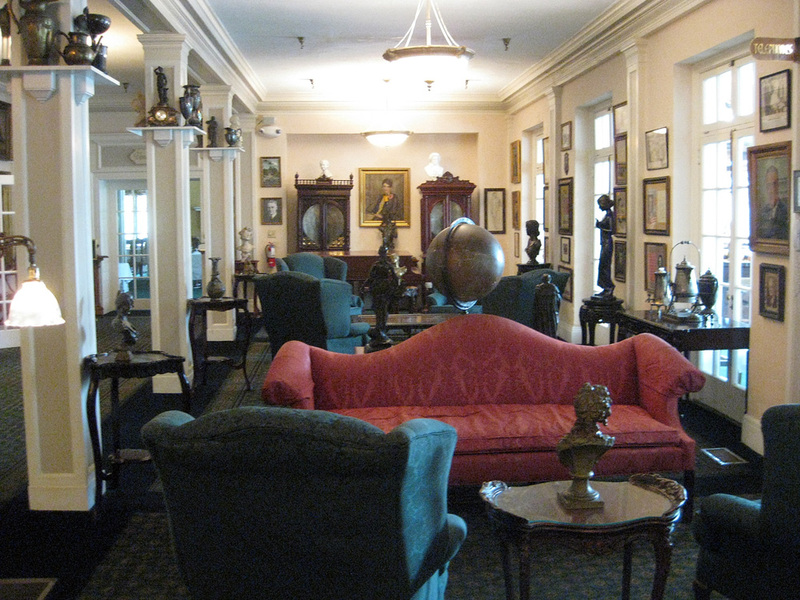 or at least the lobby is, and I’m willing to bet that the rooms are too. And not as expensive as I thought – off season (I assume that means from after the leaves have fallen in autumn until new leaves replace them in the spring) one can book a room for as little as $109 a night. We had a stroll around, then headed onward to the main attraction of the day: Chimney Rock. To get to this impressive sight one must drive up (that is PHIL must drive) around hairpin curves, then pay a hefty fee -- $15 per person – to gain entrance to the park proper and to the parking lot. If one goes no farther than this, one is rewarded with a wonderful view of the lake and valley below, but of course one is tempted to get to the top of the chimney. There are two ways to do this (unless one can fly! ): via an elevator or via a sturdy wooden staircase. It was a beautiful day so we decided to make the climb. I won’t say we were foolish in doing so, but the, I have discovered since, consists of 491 steps. Phil, younger, more athletic and more agile than I, practically ran up all 491 and patiently waited for me at the top. And if you believe that I have a bridge I want to sell you – or a gorge! We both huffed and puffed – I have been up at least that many steps to get to the top of cathedrals and towers in Europe, but I have never mastered that many steps with anything like ease. 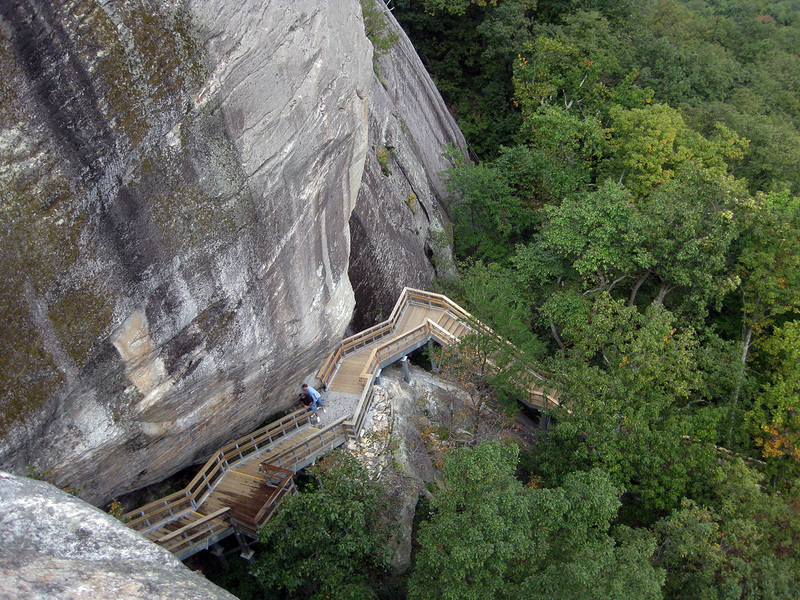 But it IS beautiful every step of the way up Chimney Rock and I think it was more than worth it. Next time, however, I think I’ll head up via elevator and walk DOWN the steps. I'm not going to spend much time on the view from the top. I'll let the photos do that, as a picture, particularly in this case, is worth a thousand words. We enjoyed the vistas, chatted a bit, then, because discretion is always the better part of valor, took the elevator down! There is a waterfall on the mountain, Hickory Nut Falls, which at 404 feet is said to be one of the highest east of the Mississippi. I thought I knew THE highest, as I was always told that Taughannock Falls just outside of Ithaca, which I have seen many times. The terrain in the Finger Lakes is not nearly as mountainous as is this section of North Carolina, but the area around Ithaca is as the saying goes, GORGES, and gorges yield great heights. However, my research yielded a shocking statistic -- Taughannock Falls is a mere 215 feet in height. Puny in compare! How do these rumors get started? Anyway, the comparison between the Finger Lakes region in New York State and this region is apt. While hardly the tallest, Taughannock is quite a sight. I can hardly wait to get back to Chimney Rock now, to see what a really tall fall looks like! 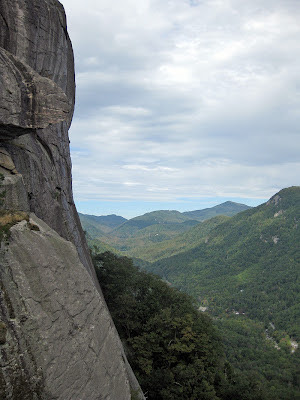 To continue the comparison, there is a waterfall in North Carolina, not too far from Chimney Rock, called Buttermilk Falls -- and there is a Buttermilk Falls farther north as well in where? You guessed it -- Ithaca NY! Phil drove us back down the mountain so we could have a quick look and hopefully lunch as well, in the village below Chimney Rock, luckily enough, Chimney Rock Village. This village is worth a quick look, but I'm not sure how you'd be able to give it much more time, as it is so small. We were on Main Street, but I think you could also title it Only Street. It's cute and it's quaint, and there's a cool store that features a lot of Native American crafts and books etc. Also a great place called Bubba O'Leary's General Store! (Bubba O'Leary?) Restaurants there are as well, but Phil and I both like a pint of beer with our sandwiches and beer was in sparse supply in Chimney Rock Village. So we headed back to Lake Lure, and found fairly few places there that served it (or lunch) as well. 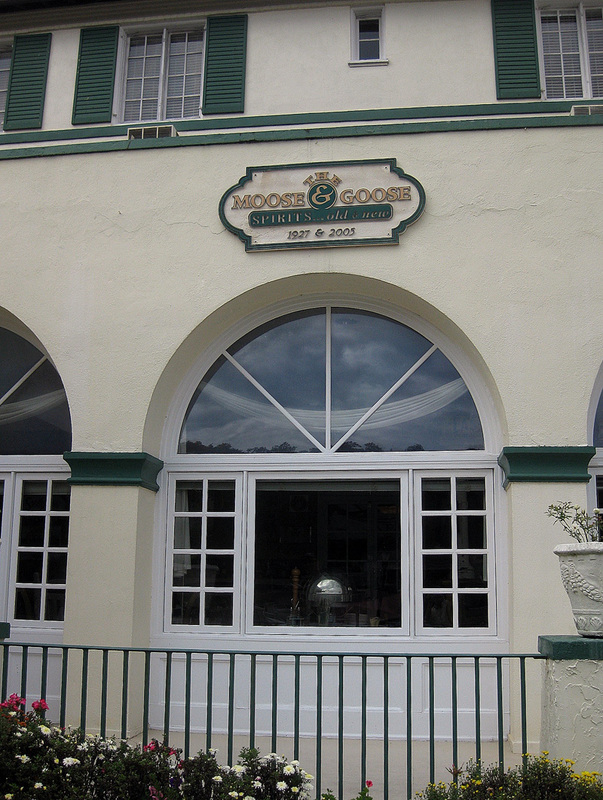 There is a great looking bar in the 1927 Lake Lure Inn and Spa (that title again!) called The Moose and Goose ? so we thought we'd eat there, but, alas, it was closed. My Burrito Macho - oi! the ingredients sounded terrific but I should have examined the title more closely. Before you order a Burrito Macho you should think twice about the title. 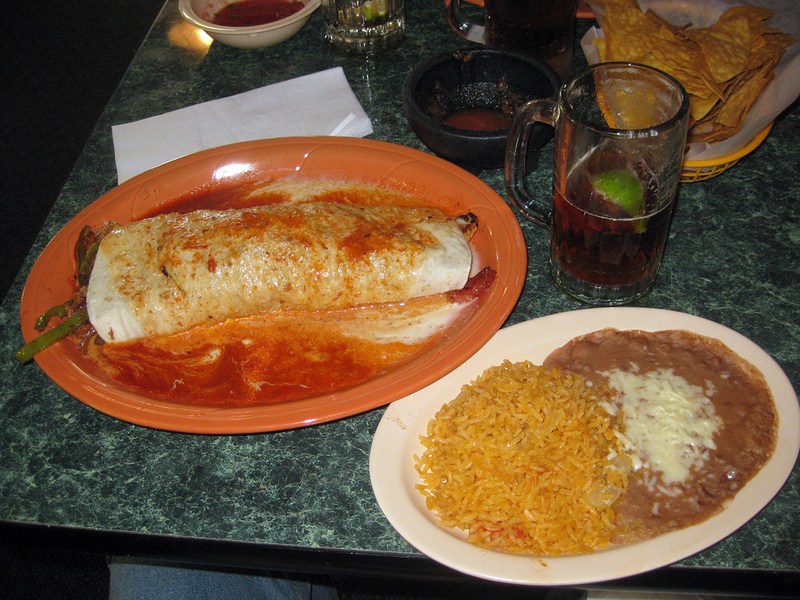 There are a number of ways to interpret it, but El Lag's interpretation was the largest burrito I'd ever seen! I got through a third of it, had the rest put in a box and when I got home picked out the chicken, which was very tasty, and had it in a salad that night. And then we headed back. Oh! 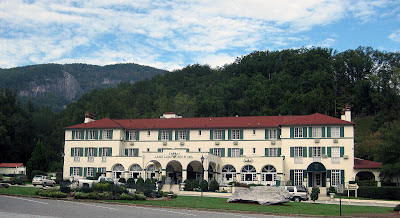 But I must mention the movies that were shot, in part, in this location: Dirty Dancing at Lake Lure -- only parts of it, as the town would have had to shut down almost completely to allow for the lengthy production schedule. Quick sidebar: why shoot this film in North Carolina when it takes place in the Catskills? Because North Carolina is a right to work state and it's a much cheaper proposition. 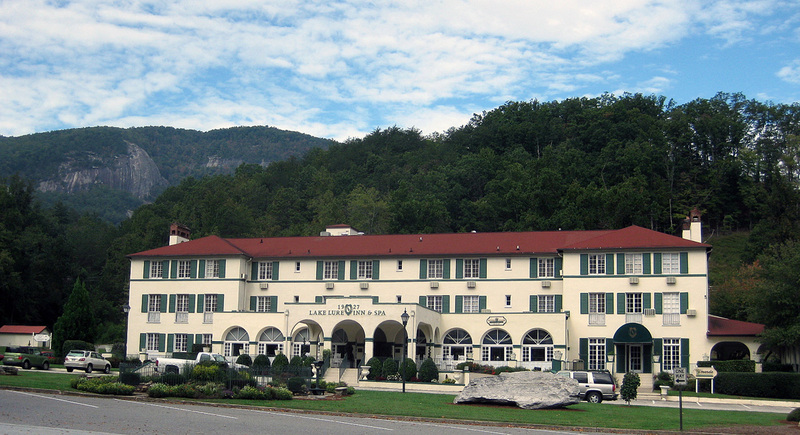 But Patrick Swayze and the Grey girl both stayed at the Lake Lure Inn -- all very exciting! AND the final seventeen minutes of The Last of the Mohicans was shot on Chimney Rock. But wait! Aren't the Mohicans a tribe associated with New York State? Why wasn't it shot there? See above paragraph. Parts of other films were also shot in this beautiful neck of the woods, and even forgetting right to work, it's easy to see why! Th-th-th-that's all folks! But I expect to do more day trips soon, so you can expect more blog posts soon as well. Till then!